The SparkMaker began life as a $99 Kickstarter, which I was understandably skeptical of. 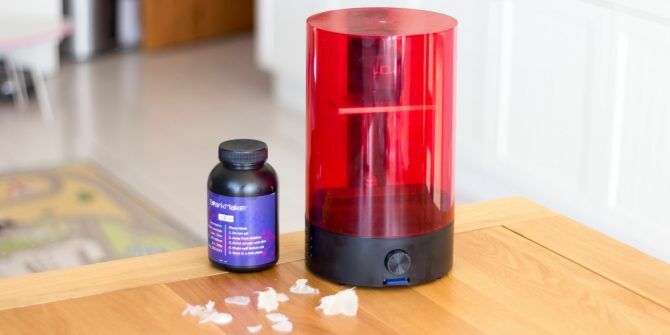 Not only was that a ludicrously cheap price for a 3D printer, it was absolutely preposterous for an SLA 3D printer – which was previously the domain of much more expensive industrial printers. 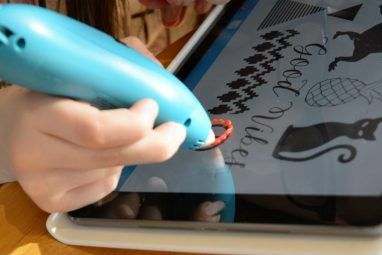 It’s now in production, shipping to backers, and available for just shy of $300 from OGadget for everyone else – but is it worth it? What is an SLA / Resin Printer? 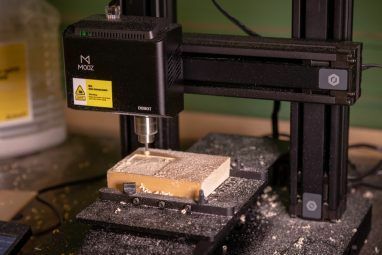 Until now, most consumer grade 3D printers have been FDM – or Fused Deposition Modelling. They use a raw material of plastic spaghetti-like filament, heat it up to around 200C, then push it out and let it cool down in the shape you want. The resolution of an FDM printer can go up to around 50 microns, though this can be improved with smaller hot end mods. There’s a huge range of printers of FDM printers The Best 3D Printer for Your Budget in 2017 The Best 3D Printer for Your Budget in 2017 If you're looking for a 3D printer, we've got you covered. We've covered the overall best 3D printer, the smallest, the fastest, and the cheapest -- and for all budgets, starting at $300! Read More to choose from, suitable for all levels of experience. 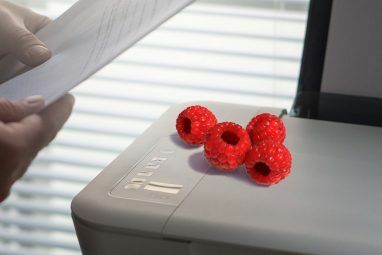 An SLA (or StereoLithography Apparatus) printer uses photosensitive resin as the raw material (a liquid), which solidifies when exposed to UV light. This can come either from a moving UV laser, or in the case of the SparkMaker, UV LEDs and an LCD screen to mask off each layer. As the print solidifies, it’s pulled out of the resin tank. The reason why SLA printing is so exciting is that the quality can be so much higher: up to 10 microns on the SparkMaker. The printer, with red plastic cover. Hex tool, for levelling and unscrewing the resin vat. Power supply and appropriate IEC cable for your country. Your choice of resin, if you chose the sample set. Gloves. Don’t touch resin, it’s horrible sticky stuff. A metal spatula, for removing the print. 99% Isopropyl cleaning liquid, for any resins other than LCD-W.
A syringe, for removing leftover resin back to the pot. You can just pour it back, but it’s a bit messy. UV curing light, such as those used for nail art. You can also cure in the sun, but it’ll take longer. A replacement FEP sheet for the resin vat. The SparkMaker has a total build area of around 4 x 2.2 x 5 inches (102 x 56 x 125 mm). The unit itself measures just under 11 inches (275 mm) tall with a diameter of 6.5 inches (165 mm). It’s compact, and looks quite neat on your desktop. Everything is enclosed in the large translucent red cover, though this isn’t fixed in any way, it just sits on the base. Inside is a single moving axis that pulls the print bed into and out of the resin vat. Underneath the resin vat is a small LCD screen, and underneath that, enclosed in the base, is the UV LED array that cures the resin. If you’re concerned at this point about safety, then that might be wise. Despite the friendly exterior, this isn’t a complete starter kit considering the additional safety equipment and processing materials required. Nor would I recommend it for use with children. With a filament based printer, the only real worry is the very hot end; this has the potential for worse. That said, adults needn’t don’t worry too much – we’re not talking vats of acid that will burn your skin off here, just some gross sticky resin that’s horrible to try and remove. You also need to take extra precautions when disposing of waste resin. You shouldn’t wash it down the sink. If you leave any waste liquid resin in the sun for a while, it should solidify, and can be placed in the normal trash. In some places, it’s classified as hazardous waste, so do check local laws. Also worth noting is that the film on the bottom of the resin tank is a consumable item, called an FEP sheet. It’s a special non-stick surface used to ensure the print can actually be pulled upwards after curing. For some reason, the fact that this needed to be replaced wasn’t actually outlined in the manual. They cost around $5 each from a third party supplier when bought in bulk, but there’s no precise definition for when you should replace it. Basically, if your prints start to lose definition, if the sheet is too hazy, if it has a scratch on it which will show upon your print, or if it’s got a crack, it needs to be replaced. In fact, the one supplied out of the box is pretty horrendous, and will result mostly in failed prints, so you may want to go buy a new one anyway. After a few weeks of trying to print, ours is in dire need of being replaced already. Just something else to add to that growing shopping list of essential accessories. Also in terms of safety (yep, there’s more) – don’t power on at the plug socket until you’ve inserted the DC power jack into the unit, or you’ll get literally sparks. That’s right, the SparkMaker makes sparks when it’s plugged in. You couldn’t make this up if you tried. Using the SparkMaker is (frustratingly) simple. The only method of getting a print onto the device is through the included SD card. It can only hold a single print at a time, so you’ll need to head back to a PC to transfer another file over. There is no USB connection or Ethernet port, and it can’t be interfaced with Octoprint. When you’re ready to print, fill the resin vat with your choice of resin, to approximately 1/4 inch (6mm) deep, put the cover on, and press the single button. The print bed will be lowered into the vat, and begin printing. Cleanup and post-processing is lot more effort, though. If you want to slice your own models, you’ll need to download the Windows-only (at the time of writing, though a Mac OS version is promised) custom software, called SparkStudio. This includes settings specific to the printer and type of resins, and will output a “print.wow” file. The files are around 50-100MB in my experience, which is larger than your typical G-code file. G-Code files for FDM printers are really just text commands that describe movements of the print head. I suspect the SLA files are larger because they contain thousands of “images” for what must be displayed on the LCD screen and cured on each layer, effectively a little video file. SparkMaker offers a range of resins at around $50-80 for 500g. The cost per gram is significantly higher than plastic filaments (at least five times as much), though the objects you print will be smaller. As mentioned, you’ll need 99% Isopropyl Alcohol to clean the prints and resin vat after each print. However, SparkMaker have produced an alternative resin (LCD-W), which can be cleaned up with just water. This is a great option that avoids noxious smells and makes the whole experience a bit safer and cleaner. The prints made of LCD-W tend to be quite brittle, however, so it isn’t quite the ideal solution. The resins are clear, but can be tinted with special color mixes. The dragon head on the right is the only part of a larger SparkMaker sample that we could salvage. I should say that the partial prints we did get were incredible. For wargaming / RPG miniatures, jewelry, or other highly detailed small models, SLA printing is clearly the way forward. Should You Buy a SparkMaker? The quality of prints you can get out of the Spark Maker are stunning. When it works, that is. If you’re serious about printing little custom miniature and models with insane levels of detail, a resin printer is the only way. Unfortunately, I just can’t recommend the SparkMaker – not at the moment anyway. The closed Facebook group is full of posts from people experiencing similar frustrations. Those that have had success appear to be both replacing the FEP film out of the box, and doing a modification to bring the LCD screen closer to the bed. The latest announcement indicates that SparkMaker have made some hardware improvements for pre-orders that haven’t yet shipping, so that’s a good sign the issues have been identified. If you order now, you may not face the same problems. However, we can obviously only report on our experience. In a break to the norm, we won’t be running a giveaway for the SparkMaker: you’d spend more on consumables and accessories than you’d get out of it. I’ll be following the modding process, replacing the FEP sheet, keeping an eye on software updates, and trying again. If results improve, I’ll update this review accordingly. I joined a Kickstarter for the Sparkmaker and was promised to have it last November. Then around November they came out with a message proclaiming a 45 day delay in shipping. Their last update which was past the 45 day extension was about how they were delayed for some improvements, testing, and production delays due to the Chinese New Year. I have still yet to receive a printer and read others on their activity feed making the same complaint as myself. Is there just a few of us who have not been ship our printers, or are there quite a few of us still waiting? I tried messaging them and never got a reply. I messaged them again today, demanding shipment, or a refund. I see they had an add out for a new printer version. They are advertising on Amazon and other places. I have read here some of you have the printer so they obviously have a product to ship. Frustrated beyond belief at this point! So I have a sparkmaker. It is defiantly not a high end printer.. but it can print and it does work. 1. The fep file that arrived with the resin tray unit was cloudy. 2. It needed a firmware update out of box. 3. The resin that shipped with mine.. was not good. so i purchased good resin. right now I'm using wanhao gray. once I had good resin and my settings dialed in Its been fairly reliable. Oh how wrong you are! I'm a professional 3d Printer as in I make a living in the industry. What Sparkmaker has made does in fact work and astonishingly well in my opinion. YOU CAN NOT BEAT WHAT YOU GET AT 299.00! I've had the same issues with mine. wasted 1 L of resin without any results. Even opened a paypal dispute, as it was not as advertised, and it was denied. it was a "non refundable" item. I do see potencial, but right now, it simply doesnt worth it. If it sparks when you plug it in, I wouldn't trust any of the electrics involved. Sounds like a dangerous machine to me. Until it earns a UL cert, I'll stay miles away. At least you aren't offering it as a giveaway.